Was the Monday Night War ending truly ‘Best for Business’? In March of 2001, WWE (World Wrestling Entertainment) announced the purchase of rival WCW (World Championship Wrestling), and with that announcement came the entire dynamic of professional wrestling changing forever. Wrestling fans who dreamed of matchups that were never conceiveable before, all of a sudden those matches became possible, and with that possibility came an excitement that was almost tangible. But looking back almost 17 years later, was it as good of a thing as the fans initially thought? This writer says no! The WCW (and eventually ECW) “Invasion” of 2001 brought about massive excitement in the pro wrestling fan community. Though the wrestlers that came over during the Spring of 2001 talent acquisition wasn’t the best that WCW had to offer (Booker T & Diamond Dallas Page being the 2 biggest superstars WWE got initially), the mere fact that the WCW logo appreared on WWE TV was enough to create a buzz that was unprecedented. WWE produced good television during that time with better than good storylines that pitted WCW World Champion Booker T vs. The Rock and The DDP stalking the Undertaker’s wife angle which was well done in this writer’s opinion. As the Invasion storyline concluded with the Company vs. Company Winner take all Elimination match at the Survivor Series in the fall of 2001 (Ironically 3 of the WCW/ECW Alliance competitors were stars that gained the height of their success in WWE <Stone Cold Steve Austin: Then-WWE Champion, Kurt Angle: Former WWE Champion who never wrestled in the original ECW or WCW, Shane McMahon: The storyline owner of WCW who in actuality was an executive in WWE and son of WWE Chairman Vince McMahon>), so too did the ECW/WCW Alliance conclude as well. Towards the end of 2001 and for the next few years following, more and more WCW talent made their WWE debut (or re-debut). 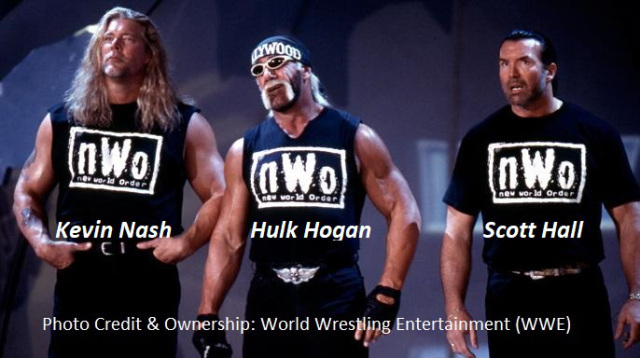 Wrestling icons Hulk Hogan, Scott Hall, and Kevin Nash reformed the New World Order, Ric Flair returned to WWE for the first time since 1993 to become the storyline co-owner of the company, and Goldberg would make his WWE in-ring debut in April of 2003 against the Rock. This writer believes that as good as the Invasion angle was, and as exciting as it was to hear of Vince McMahon’s acquisition of his rival company, looking back I don’t believe it was “Best For Business”. The key word is competition. When WWE went head to head with WCW (and ECW to an extent), it was all about competition which, for a 3 or 4 year period, brought out the best in both companies. Every week WWE produced a “WrestleMania Season” type of show in an attempt to gain victory over World Championship Wrestling. 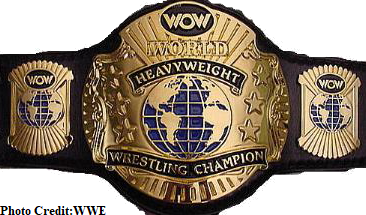 Every week wrestling fans from coast to coast were treated to the very best both companies had to offer, but sadly now with limited competition (All due respect to Impact Wrestling, Ring of Honor and others) due to lack of production value and competitive salaries, the wrestling world just isn’t the same. Don’t get me wrong, I loved wrestling before the Monday Night War, I loved wrestling during the Monday Night War, and I love wrestling now… But without the urgency or competition, there is an element or value that is missing. Perhaps that is the reason why Smackdown Live, Monday Night Raw, and even NXT seem to compete against each other, but without a real fire being figuratively lit under WWE by a brand outside of the World Wrestling Entertainment umbrella, “WrestleMania season will remain what it’s been since March of 2001… A 3 month jolt of wrestling lightening followed by 9 months of waiting until the next.